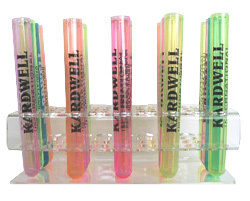 You can custom imprint these 6-Inch Crystal Plastic Test Tubes with any one-color design you choose. The following translucent tube colors are available: clear, ruby red, sapphire blue, and emerald green. 1,000 piece minimum order. For Acrylic Test Tube Racks, please visit our Bar Supplies section. Feel free to browse our Plastic Glasses and Glass Glasses for additional Custom Drinkware selections.